Be a Part of Public Art at Right-Brained Studio! Yarn Bomb! Instructor Tamara Matthews. Crocheters and knitters these days are not satisfied with creating just apparel with their craft–they’re taking yarn to the streets! 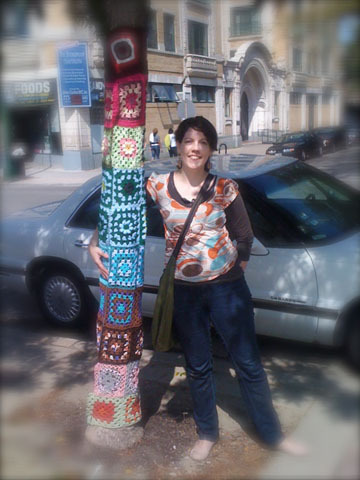 Yarn bombing in an increasingly popular activity that you can find in cities around the world where crocheters and knitters use their skills to create public art. 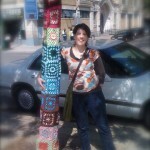 Come learn to create a yarn bomb of your own. We’ll spend the first part of the workshop learning the basics of crochet and how to build a granny square and the second part finalizing our squares and putting them on display. Sign up for 1 workshop or all three…Beginners and advanced crocheters welcome! Please view our Saturday “a la cARTe” Workshops under the 2012 ART CLASS SCHEDULE for more information. This entry was posted in "a la cARTe" Workshops, Uncategorized. Bookmark the permalink.